COSRX Aloe Soothing Sun Cream SPF 50+ uses 5,500ppm of Aloe Vera Leaf Extract to moisturise, soothe and protect your skin from the sun’s harsh rays. Read an honest product review of the COSRX Aloe Soothing Sun Cream SPF50+ by Sydney beauty blogger, Thy Tran. If you purchase this product you will earn 19 Points! This moisturising sunscreen is lightweight in texture and will effectively protect your skin from UVA and UVB rays. Once applied, it does not leave a white cast on your face or make your skin feel greasy. Aloe Vera keeps your skin hydrated throughout the day and its quick absorbing abilities allow for a smoother makeup application. 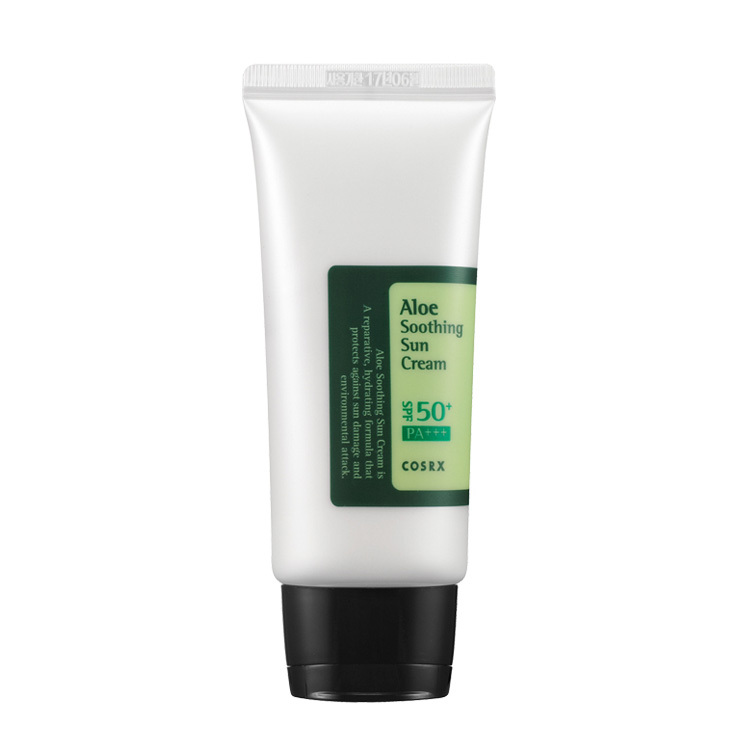 COSRX Aloe Soothing Sun Cream is a best selling sunscreen and Korean beauty favourite. Aloe Vera 5,500ppm – delivers moisture that is absorbed by skin 4x quicker than water. Most commonly used for soothing irritations, sunburns and inflammations and relieving redness. Apply a generous amount on over face 30 minutes before sun exposure. Reapply throughout the day as needed, especially during prolonged sun exposure.